Yellow Pikmin (黄ピクミン?) are the second type of Pikmin discovered by Captain Olimar, and their first discovery is in Pikmin. They are the fourth type identified in Pikmin 2, and they're first found with Charlie in Pikmin 3. These Pikmin have what would appear to be large ears; these are the means by which they are primarily identifiable. It is not known, however, whether or not this actually aids their hearing. 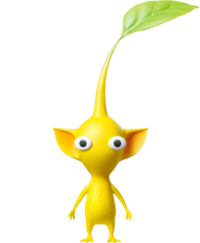 Yellow Pikmin can be thrown higher – an ability that is needed to retrieve certain elevated ship parts, treasures and fruits – and are immune to electricity. Additionally, Yellow Pikmin appear to like being in elevated places, such as trees – this can be concluded from the places they are found in in Pikmin 2 and Pikmin 3. Like all other main types of Pikmin, their buds and flowers are white, and their main method of production is through the Onion. Like Red Pikmin and Blue Pikmin, they appear in all games of the series, and in all game modes. Yellow Pikmin showcasing their ability to conduct electricity. Yellow Pikmin seem to have varying abilities that either change or get discovered as time goes on. In all three games, they have large ears, and can be thrown higher than other Pikmin, which is used at times throughout the games. In Pikmin, Yellow Pikmin are the only ones able to wield bomb-rocks, for whatever reason. Digging into the game's files has revealed that all Pikmin were originally supposed to be able to wield bomb-rocks. Because of the rare circumstances in which these Pikmin are needed, they are arguably the least useful type in the first game. In Pikmin 2, the electrical hazards surface, with Yellow Pikmin now being immune to them (alongside Bulbmin). Additionally, when Olimar discovers the Yellow Pikmin, the Hocotate ship states that the static electricity readings are high. The explanation for this is never revealed, either. Although bomb-rocks appear in the same game, Yellow Pikmin are unable to use them, possibly due to the objects being much larger. Their immunity to electric hazards is very helpful, as electricity is an otherwise instant-death hazard. In Pikmin 3, Yellow Pikmin once again exhibit their immunity to electricity and their ability to be thrown high. Technically, Yellow Pikmin are able to use bomb rocks again, but this isn't anything notable since all types of Pikmin can do so in this installment. Yellow Pikmin also show a new ability – they can dig faster than other Pikmin (although Rock Pikmin can dig tunnels even faster). This is never explained, though it could be because the ears act as a sort of shovel. This ability is rather helpful, since a number of objects in the game are buried. They also can now conduct electricity. If a circuit is incomplete, enough Yellow Pikmin can continue the flow of electricity and complete it. The Yellow Pikmin also get flowered in the process, somehow. Their immunity to electricity is less useful now, as electricity only stuns other Pikmin, as opposed to instantly killing them. Interestingly, in New Play Control! Pikmin and New Play Control! Pikmin 2, if Yellow Pikmin are thrown from a piece of chiyogami, a plant, or a fire geyser, they will ascend higher and fall more slowly. This does not work on the GameCube versions. The Yellow Pikmin resting on a tree in Pikmin 2. In Pikmin, a single Yellow Pikmin can be found in The Forest of Hope inside a dormant Yellow Onion. The Onion is located near a few Spotty Bulborbs and yellow pellets. It can be seen from the landing site, and is at the west of the map, beyond the area with the Eternal Fuel Dynamo. When the Onion awakens, it spits out the seed it has. Olimar uses this to grow more, eventually discovers their ability to handle bomb-rocks from the explosives nearby, and uses them to clear the path to various other ship parts. In Pikmin 2, one can find a group of five in the Perplexing Pool near the center of the map, at the end of a long and twisted path; White Pikmin are necessary just to reach them, and a Fiery Bulblax guards the entrance to their Onion. They are found relaxing on top of a tree, and exhibit static electricity flowing from their bodies on their discovery cutscene, which is triggered after they are whistled down from their spot. The Hocotate ship states that the static electricity readings are "unusually high". 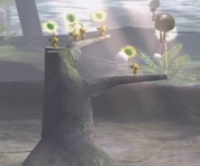 In Pikmin 3, Yellow Pikmin are first encountered by Captain Charlie on day 1, at the Distant Tundra, with some of them idling atop some tree branches. However, they are not officially introduced as Yellow Pikmin yet. After helping him for a bit, they flee when he faces the Vehemoth Phosbat. Later on, when going to the Distant Tundra for the first time with Alph and Brittany, Brittany falls out of the ship and into a cave (which consequently separates her from Alph). She finds two Yellow Pikmin trying to complete a circuit in the cave. The player must pluck three buried Yellow Pikmin nearby to complete the circuit; upon doing so, a light-bulb is activated, causing the Yellow Onion to fly up out of the ground. Brittany then uses the newly discovered Pikmin type to reunite with Alph. Yellow Pikmin must be used in order to obtain the following objects and defeat the following enemies. No other Pikmin type can be used, not even with exploits. There is no task in the game that mandatorily requires Yellow Pikmin. Although only their bomb-rocks can be used to take down reinforced walls, all of the walls in the way of ship parts can be circumvented in other ways. Those, and other ship parts that would normally require Yellow Pikmin, are explained in the recommended uses section. There is no task in Pikmin 2 that requires Yellow Pikmin exclusively. Even if Yellow Pikmin are required to destroy electric gates, none need to be taken down for a full completion. All treasures can be collected with other Pikmin types with the use of exploits, detailed in the recommended uses section. Disguised Delicacy: The one in the Distant Tundra is in a crystal in the room where Yellow Pikmin are discovered, meaning the room must first be opened. Pocked Airhead: The one in the Garden of Hope is in a room closed off by an electric gate. Astringent Clump: The one in the Garden of Hope is in an area closed off by an electric gate. Although one could throw a leader to the bricks above the gate via the first set of elevator platforms, and then using Winged Pikmin with the charge command, the gate still needs to be taken down. Stellar Extrusion: The one in the Garden of Hope requires an electric gate to be destroyed. Citrus Lump: One in the Distant Tundra can only be collected if the Bloominous Stemples are first expanded. While Winged Pikmin can reach it, they will simply drop into the maze of stems below, and be unable to carry the Citrus Lump anywhere meaningful. Electric gate: Electric gates can only be destroyed by Yellow Pikmin. Although not mandatory, Yellow Pikmin are important in the completion of the following tasks. Positron Generator: Yellow Pikmin are needed to take down the reinforced wall with bomb-rocks, although by throwing some Pikmin out of bounds on the stump with the three large pellets, and then having Olimar lie down next to the pellet on top of the trunk-like structure at the south, he can squeeze through and go out of bounds, and then use the Pikmin that got thrown to enter the beach area without taking down the reinforced wall. Whimsical Radar: The area it is in is behind reinforced walls. But by using a pellet dropped by a Dwarf Red Bulborb near the Yellow Onion, it is possible to clip out of bounds and onto the ledge with the ship part. From there, the player can push the part past the reinforced wall and have it recovered from there. Using the nearby Red Bulborb to push the part helps. Extraordinary Bolt: This part is inside a room, blocked by a reinforced wall, but by going out of bounds with the same method as the Whimsical Radar, the player can lie down and push the part to the corner of the room. After doing so, the part will reappear outside the room the next day. From there, it can be pushed through the Yellow Onion gate by the nearby Red Bulborb, like with the Whimsical Radar. Radiation Canopy: Like the Whimsical Radar, the section this part is in is behind reinforced walls. But by throwing Pikmin at the ledge surrounding where the Yellow Onion is found, and by going out of bounds with the same method used to get the Whimsical Radar without Yellow Pikmin, the player can guide the Pikmin to the ship part, and take it to the part of the area north of the landing site. From there, they can follow the same procedure as the Whimsical Radar to get the part on the other side of the Yellow Onion gate. Nova Blaster: Same as the Radiation Canopy. Geiger Counter: The path to the section of the area with this ship part is blocked by a reinforced wall. However, by throwing the Pikmin to the ledge with the Snagrets, and then using a pellet obtained through a Dwarf Red Bulborb near the gate, it is possible to clip through the wall and go to the upper ledge, and bypass the reinforced wall entirely. After the Snagrets are fought and defeated, the Geiger Counter can be pushed over to the lower level and carried to the ship. Guard Satellite: The reinforced wall before the Beady Long Legs needs to be destroyed with bomb-rocks. However, by leaving Red Pikmin on the ledge to the side of the gate, and having a nearby Wollywog push Olimar through the gate, it is possible to defeat the Beady Long Legs without using Yellow Pikmin. After that, the same Wollywog can be used to push the ship part close enough to the gate, such that after the day ends, the Guard Satellite appears on the other side of the gate at the next day. Libra: The part is on two platforms too high up for other Pikmin to reach. However, with high ledge throws, it should possible to bring Reds or Blues to the Libra. Alternatively, one can get a pellet near the railing wall thanks to a Shearwig, get between the two, lie down to pop up on the railing, and from there walk up to the ship part, where it can then be pushed down. UV Lamp[source needed]: The part is on top of a ledge that is too high for Pikmin to be thrown normally. Secret Safe: If a bomb rock spawns below the ledge where they normally spawn, Captain Olimar can lie down between it and the wall to pop up on the platform where the bombs usually spawn. From there, the player can meet up with Pikmin thrown at a high ledge on the other side of the area. To recover the ship part, it has to be pushed into the opening after the second bridge by lying down, then pushed into the water, and then all the way until after the first gate. Healing Cask (US) / Hypnotic Platter (Europe): It is on a high ledge, though with exploits, other Pikmin can reach it as well. Decorative Goo: To reach the treasure, the electric gate blocking the northern section of the map needs to be cleared. But by using the carrying charge glitch, the treasure can be sped up behind the gate, and carried over the wall next to the gate. Gherkin Gate: The treasure is on top of a high ledge, requiring Yellow Pikmin to reach it. The high ledge trick can also be used to get it with any other Pikmin type. Impediment Scourge: Same as the Gherkin Gate. Optical Illustration (US) / Abstract Masterpiece (Europe): The treasure is in a room closed by an electric gate. By using the carrying charge glitch, it can be carried past the gate, though. Conifer Spire: There is an electric gate blocking the path towards this treasure. The player can charge the treasure and make it go past the electric gate. Alternatively, the player can reach the Conifer Spire in the same way they can reach Hole of Heroes (see below). Then, they can move the treasure up the bamboo chute towards Hole of Heroes by exploiting a strange treasure mechanic. At some point, the treasure must clip through the floor, which happens for unknown reasons. Then, once the treasure is located by Hole of Heroes, the Pikmin will carry Conifer Spire in a path that does not go through the electric gate..
Anode Beetle: Anode Beetles can shock other types of Pikmin if there are at least two, which will instantly kill them. However, it is possible to kill them even with no Yellow Pikmin. Bulblax Kingdom: The entrance to the cave is blocked off by an electric gate. It is, however, possible to access the cave without destroying it, by exploiting a carrying path oversight. Shower Room: The access to the Shower Room is blocked off by an electric gate. With the seesaw block glitch, it's possible to enter the tile section of the map where the cave is without destroying the gate. Glutton's Kitchen: The cave is blocked by an electric gate, but with a carrying path oversight, it's possible to have a Pikmin carry a leader over the wall, leading to the entrance of the cave. Hole of Heroes: The path towards Hole of Heroes is obstructed by an electric gate, but the player can go around it while out of bounds. To get out of bounds, the player can utilize the knockback from a Fiery Blowhog, a Creeping Chrysanthemum, or a Gatling Groink. Blue Onion: The electric gate the blocks the path to the Blue Onion can only be destroyed by Yellows. Despite that, one can reach the Onion by using the seesaw block glitch. Disguised Delicacy: The one in the Tropical Wilds is inside a Shaggy Long Legs, and its arena is closed off by an electric gate. The player can also summon it from the other entrance as well. Stellar Extrusion: In the Tropical Wilds, the branch it is on is attached to a high area that requires a Yellow Pikmin seesaw block puzzle. Alternatively, it can be accessed by manipulating the camera and sending Winged Pikmin to charge at it. Vehemoth Phosbat: This boss can only be harmed normally by lighting up the room, which can only be done with Yellow Pikmin. Although with perseverance, it's possible to defeat it with any Pikmin type, given that it becomes temporarily vulnerable when it is using its sucking attack. Bearded Amprat: This creature can emit electricity and stun all non-Yellow Pikmin. This article or section is a short summary on Pikmin as fighters. 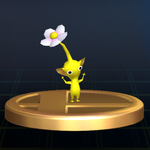 Yellow Pikmin appear in Super Smash Bros. Brawl and Super Smash Bros. for Nintendo 3DS and Wii U as a trophy, and a kind of Pikmin Olimar can pull from the ground using his Pikmin Pluck special move. Yellow Pikmin, like in Pikmin 2, are immune to electrical moves like Pikachu's Thunder or forward smash, and can attack with electric properties. They are also thrown higher and longer than other Pikmin. In Brawl, a sticker for a Yellow Pikmin also exists. “A type of Pikmin. Take a nutrient-rich pellet to a flying saucer known as an Onion, and it will produce the mysterious beings known as Pikmin. Yellow ones fly higher than other Pikmin when tossed by Olimar or Louie. Unlike other Pikmin, they're also highly resistant to electricity, which makes them invaluable when battling enemies like anode dweevils. “This yellow Pikmin is sporting some pointy things on its head. Maybe those are ears? Hmm... Anyway, yellow Pikmin are immune to electricity and are the lightest Pikmin in the Pikmin series. In Smash Bros., a thrown yellow Pikmin will fly through the air in a nice curve, zapping anyone it comes in contact with. “Yellow Pikmin have big, sharp ears and conduct electricity very well. These two facts are most likely unrelated. Olimar's side special can throw this Pikmin high into the air and cause electrical damage to all fighters who stray too close! A Yellow Pikmin with a bomb rock. Yellow Pikmin artwork from Pikmin. Clay art of a flower-bud Yellow Pikmin in Pikmin 2. Yellow Pikmin clay art in Pikmin 2. The three stages of a Yellow Pikmin in Pikmin 2. A Yellow Pikmin digging out a treasure in Pikmin 2. Yellow Pikmin are resistant to electricity. Yellow Pikmin in the Lost Toy Box of Challenge Mode. Discovery of the first Yellow Pikmin. Artwork of a Yellow Pikmin. The three stages of a Yellow Pikmin in Pikmin 3. A Yellow Pikmin and a Blue Pikmin carrying a Juicy Gaggle. Artwork of Yellow Pikmin walking. Artwork of a Yellow Pikmin next to a crystallized Sunseed Berry. Finding the first Yellow Pikmin in Pikmin 3. A screenshot of Pikmin 3 featuring some Yellow Pikmin sitting on a rock, along with a few White Spectralids. Captain Charlie finds some Yellow Pikmin on top of a can in Pikmin 3. Close-up of the Yellow Pikmin on a can. Some Yellow Pikmin digging out a buried item. The data file explaining that Yellow Pikmin can connect electrodes. The data file explaining Yellow Pikmin's innate insulation. The data file explaining Yellow Pikmin's throwing arc. The data file explaining Yellow Pikmin's digging ability. A Yellow Pikmin in Super Smash Bros. Brawl. The Pikmin's e-card, #00 (1st yellow card). Yellow Pikmin's abilities explained in the manual of Pikmin, Pikmin 2, New Play Control! Pikmin 2, New Play Control! Pikmin and Pikmin 3.